Location Wynn is the last hotel on the North on the main part of the Strip, on the site of the Desert Inn next to Palazzo and opposite the Fashion Show Mall. 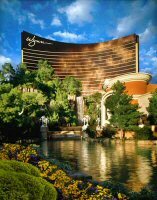 Theme It’s what Steve Wynn does best first at Golden Nugget, then at Mirage and Bellagio and now at Wynn, luxury. I guess you could say European luxury, or that is what Mr Wynn would like you to say everything is there to show opulence and to look expensive, now expense spared. If money is not the object then the objects here all cost a stack of money. Attractions The showpiece is the “ Lake of Dreams ” a 3 acre lake which contains loads of lights to make a full multimedia show. There is a 170ft Mountain and 5 waterfalls, the show uses the water falls as screens, there are loads of bushes and flowers around them but I was not impresses with this show. As with Bellagio there is a Conservatory but smaller but really nice, no rollercoaster’s here instead you have Wynn’s gallery which hits the mark for the more refined and concerning people who are the targets of his marketers. There is also a Ferrari garage that you have to pay $10 to enter! Pool The pools here are nice rather like Bellagio style and quality are the order of the day rather than wave machines and waterfalls. Shows and Entertainment Spamalot has been running at Wynn since it opened but this is soon to end the Grail theatre will be refurbished and re opened in April 2009 as the Encore Theatre with Danny Gans (currently at the Mirage) as the headline act. Wynn's other show is La Reve its a Cirque De Soleil type show and like O performed in water, rumour has it that when he can Steve is looking at canning this and replacing it with something better he has been spotted sitting in the Audience with Andrew Lloyd Webber ! Dining You would have thought that with a resort this up market that the buffet would not have featured but you would have been wrong and it is rather modestly called The Buffet (B$17.95, L£21.95 D Sun-Thur $33.95 Fri & Sat $37.95 and Weekend Brunch $28.95 and an extra $6 for Champagne to be included. I have not eaten here but despite the price the people I have spoken to who have think its excellent value but the queues can regularly be over 2 hours long. As you would expect there is a selection of other restaurants at Wynn mainly with a European flavour don’t expect a cheap meal but that does not mean that you can’t expect value. Most of the fine dining establishments are run by celebrity chefs. If you eat at the SW make sure you get a table outside and ask to have one with a good view of the show. The coffee shop at eth drugstore has fantastic coffee and great fruit salads but like everything else at Wynn it’s pricey. Zooacrackers is a great Deli with tower sandwiches and the Terrace Point Café which is open 24/7is very good again all heavy on the pocket. Gaming It’s big and surprisingly there are a load of slots including nickels and pennies with good pay out. There are stacks of tables and the norm minimum is $15 on BJ and other card games but most tables particularly at weekends are much higher. Craps sometimes starts as low as $10! Don’t bother asking to get rated if you are playing less than $25 per hand it’s not worth it. The players card is very good and well worth joining. If you were told you were in the Bellagio you would probably believe it. Drinks service Steve Wynn knows how to look after his customers even if you are on the penny slots polite waitresses come up regularly and serve you with strong drinks this is one of the best drinks services on the Strip. Overall The service from all the staff from the check in clerk to the valet parker to maid is the great the best you will get in Vegas. This place oozes luxury, it’s a nice treat but unless you have loads of money (and we don’t) you cant get the most out of it, that said however short lived you do feel like a star whilst you are there. Good points The attention to detail is amazing everything is quality and the attentiveness of the staff. Bad points The price everything from sodas in the shop to ice cream its expensive this is a place for rich folk. The location could be better but then that would make it more crowded. Top Tip Join the players card and ask if there are any promotions usually if you earn 50 points in your first 24 hours you get two free buffets.